Cover from Jordan Abel, The Place of Scraps (Vancouver: Talonbooks), 2013. For the current issue of Camera Austria International we invited the artists’ collective Urban Subjects (Sabine Bitter, Jeff Derksen, Helmut Weber) as guest editors. In their contribution they look back to sincerity’s history and pull forward moments where it speaks to our own strange and taut present. 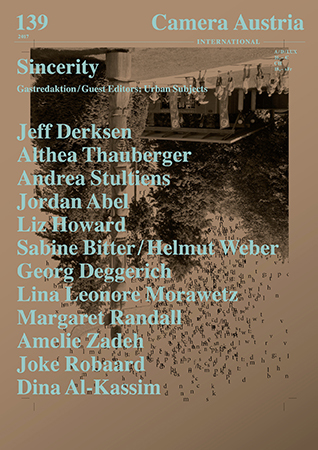 Taking Jeff Derksen‘s introductory essay “For Sincerity,” a plea for the aesthetic, material, and social possibilities of sincerity, as a point of departure, the works of artists, writers, and poets from Europe and North America selected lend insight how to think sincerity through artistic and poetic practices. Althea Thauberger‘s film Preuzmimo Benčić (Take Back Benčić, 2014) documents the actions of 67 children in Rijeka, Croatia, as they literally go through the motions of the labour that was once done in the closed buildings of the Rikard Benčić factory. Similarly, Andrea Stultiens‘s approach initiates a collaboration with Ugandan artists to rework Henry Morton Stanley’s 1875 photograph of Kabaka (King) Muteesa, an image reproduced as an engraving in Stanley’s book Through the Dark Continent (1878), within the present Ugandan context. We can also understand sincerity as a necessary aspect, or even product, of an artistic commitment to the long moment of revolution and social justice so deeply shown in the literary and photographic work of Margaret Randall who linked, through her magazine El Corno Emplumado (The Plumed Horn), the liberatory struggles in Latin America to a similar impulse and dynamic in poetry in the Global North. And, within this context, sincerity itself is a relationship embedded into what Dina Al-Kassim identifies as “the rich discourses of solidarity,” for she brings forward this powerful reminder of the language and spirit of decolonizing practices. In the works of the two Indigenous poets published—Jordan Abel (Nisga’a) and Liz Howard (Anishinaabe)—a poetics of sincerity mediates the discourses, both ethnographic and social, that have shaped the perception of Indigenous people. A sincerity to urban textures and histories is shown in the work of Sabine Bitter and Helmut Weber, who teamed up with curators Amila Puzić and Anja Bogojević and students in Sarajevo to approach the social surfaces of that city, in the performative project Nothing to Be Done (2017). This work restages Susan Sontag’s controversial production of Samuel Beckett’s Waiting for Godot at the Sarajevo International Theatre Festival in August 1993, during the siege of the city. In an interview with Georg Deggerich, the translator of Charles Reznikoff’s book Holocaust (1975) into German, Lina Leonore Morawetz examines the documentary practice of this Objectivist poet, and how he viscerally lays out the conditions of the lives of historical subjects both as a form of critique and to create a sincere engagement with the subject in history. This expanded sense of materiality relates to the photographic practice of Amelie Zadeh with her emphasis on the history and present of the photographic image, where the materiality of photographic practice is reworked spatially in order to produce new imagistic surfaces and a space where the photograph is critically examined. In the work of Joke Robaard, sincerity is performed through the enactment of the archive of fashion photographs the artist has been amassing since 1977. The issue is rounded off by a comprehensive review section with responses to recent national and international exhibitions including Peggy Buth: Vom Nutzen der Angst and Arwed Messmer: RAF. No Evidence / Kein Beweis, Museum Folkwang, Essen; Subjektiv, Malmö Konsthall; Tomáš Rafa: New Nationalisms, MoMA PS1, New York; Ericka Beckman: Game Mechanics, Secession, Vienna; Hiwa K: Don’t Shrink Me to the Size of a Bullet, KW Institute for Contemporary Art, Berlin, and many others.